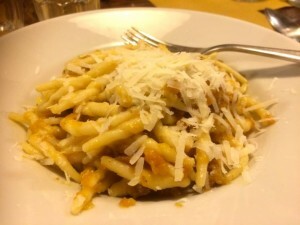 A couple of weeks ago we ate at one of my favourite trattorie, L’Osteria in Siena. 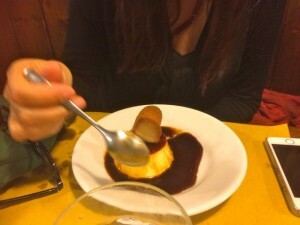 l’Osteria is located a short walk north of the Campo, Siena’s main piazza. If you follow signs to the church of San Francesco you are heading in the right direction. L’Osteria has outside tables in the summer but it was late January and this wasn’t an option on our visit. Inside the decor is unpretentious and the menu offers some really rustic local dishes such as tripe and a stew made with tongue. For those not wishing to get too adventurous there are plenty of other things to choose. 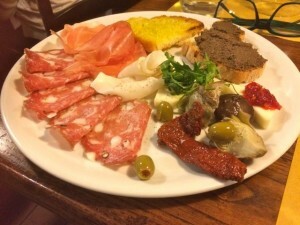 We started with a plate of mixed antipasti shared between three people. This was a delicious selection of appertisers, cold meats, cheeses and crostini. I followed this with a plate of trofie pasta with a sauce made from pumpkin and leek, if this is on the menu when you go I recommend trying it! 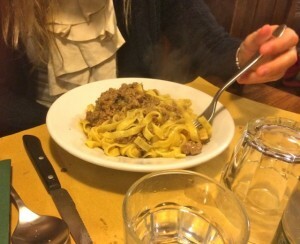 My daughter had tagliatelle with ragù in bianco (meat sauce with no tomatoes added). 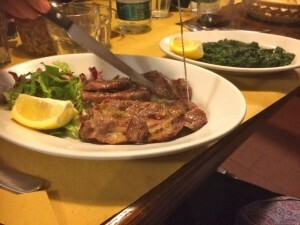 For secondi I had tagliata with meat from the cinta senese pig accompanied by a plate of spinach, it was excellent. The others ordered desserts which they assured me were delicious. 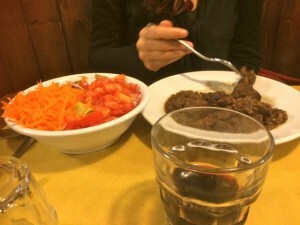 The bill was around €80 for three people and included antipasti, two pasta dishes, two meat dishes, two desserts and a half litre of house wine. Afterwards we headed out for a quick stroll around Siena.